The seventh-seeded Texas A&M University-Commerce women’s basketball team held a halftime lead, but was unable to recover from a third quarter scoring drought, falling 75-65 to second-seeded Colorado Mesa University in the South Central Regional Quarterfinal round of the NCAA Division II Basketball Championship on Friday night. The Lions – who were making their second postseason appearance in program history – finish up their season with a record of 20-11. The Lions made their first tournament appearance since 2007. – In what turned out to be her final game in a Lion uniform, Princess Davis (Shreveport, La.) scored 17 points, dished out five assists, grabbed four rebounds, and snagged four steals. She led the Lions in scoring and was one of four A&M-Commerce players in double digit scoring. – Alexis Bryant (Pflugerville) had her fourth double-double of the season with 13 points and 10 rebounds, with eight of those rebounds coming on the offensive end of the floor. – Chania Wright (DeSoto) scored 12 points and Mykiel Burleson (Pflugerville) scored 11 points off the bench. – The Lions shot 37.1 percent (23-of-62) from the floor, while Colorado Mesa made 25-of-47 (53.3 percent) of its shots from the field. 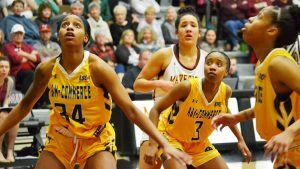 CMU made 12 three-pointers, marking only the second game all year where Lion opposition made double-digit totals from long range. The Lions were able to jump out to an early lead, forcing the Mavericks into early foul trouble in the guard positions. Bryant scored a three-point play on the game’s first possession and Davis’ free throws had the Lions up five points in the first minute of the game. A&M-Commerce scored well at the free throw line, but CMU closed the first quarter on a 7-2 run, and the Mavericks led 20-18 after that period. Wright made a layup to start the second quarter scoring, and the lead changed hands multiple times in the period, as neither team led by more than two possessions in the entire first half. CMU was up 30-27 with two minutes left in the frame, but the Lions closed the half on an eight-point surge. Three Bryant free throws, an Agang Tac (Sachse) breakaway layup, and a Burleson buzzer-beating three-pointer gave the Lions a 35-30 lead at halftime. Out of the halftime break, Mesa immediately erased the deficit, but the Lions counterpunched with a Bryant layup and Wright three-pointer to go back up five. Bryant made a layup to break a tie at the 4:28 mark, giving A&M-Commerce a 44-42, but that would be the last time the Lions scored in the quarter. Five missed shots and two turnovers by the Lions allowed the Mavericks to close the quarter on a 17-0 run, and the Lions were behind by a 59-44 count with 10 minutes to play. The Lions battled to the bitter end in the fourth quarter, and cut the Maverick advantage to as few as eight points in the final two minutes. Colorado Mesa made only one field goal in the final five minutes, but the hosts were able to sink clutch free throws down the stretch and knock out the Lions despite a 21-16 TAMU scoring advantage in the final quarter.